Samsung’s certainly celebrating a big week with a second announcement featuring their “other” flagship device and its own sales milestone. 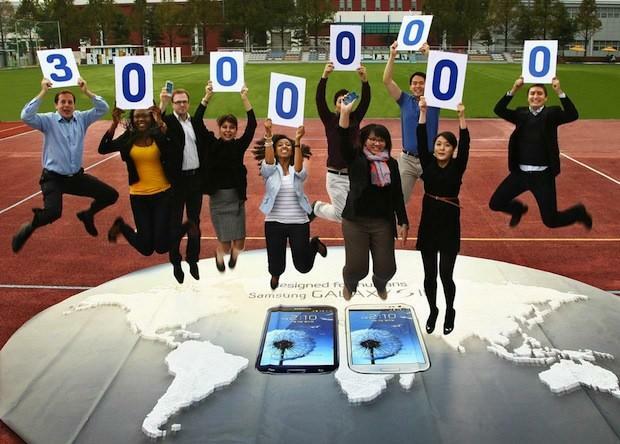 Just two days after announcing sales of the Galaxy Note II passed 3 million, Samsung’s Poland Twitter account (the Tweet has since been removed) added some more good news for the Korean manufacturer as they announced sales of 30 million units of the Galaxy S III. Samsung didn’t clarify if the number amounts to units they have sold or units they have shipped, but either way would show that Samsung is clearly riding high on their two newest flagship devices. It’s clear that Samsung is continuing to dominate the Android crowd and while LG may get some attention in the coming weeks with the launch of the Nexus 4, Samsung is quite obviously the King of the Android hill. To refresh our memories, Samsung isn’t the only company enjoying runaway success with the Galaxy S III. That’s the problem I have with manufacturers and careers taking so damn long with updates. I have GSIII which I plan on giving to my wife and getting the Nexus 4. I’ll be guaranteed updates then. I don’t care about wifi calling which I never have to use (thank goodness), and I don’t care about storage…a formatted 16gb will suffice. LG is not known for excellent reputation when it comes to phones. If this had been built by Samsung or HTC I would buy one in a heart beat. 30mil is an awesome milestone though. I have a feeling that the GNII will enjoy similar success…maybe not quite the 30mil…but a real close run. I expect our update to be bug free just because we have been waiting even though our built was the first one leaked. It would be nice if it was Android 4.2 and thats why its taking so long but that’s probably asking for too much. yayyyy i’m one the 30 Million and cant wait until Jelly Bean ! :) Galaxy S III Rocks ! I would like to congratulate Samsung with this announcement. It’s a pretty impressive number and I am glad to be a part of it. Hopefully it continues for them and they can hit a million before the Galaxy S4.